Forceful storytelling and complex characters make this sci-fi thriller the perfect finale for an amazing cyberpunk trilogy. 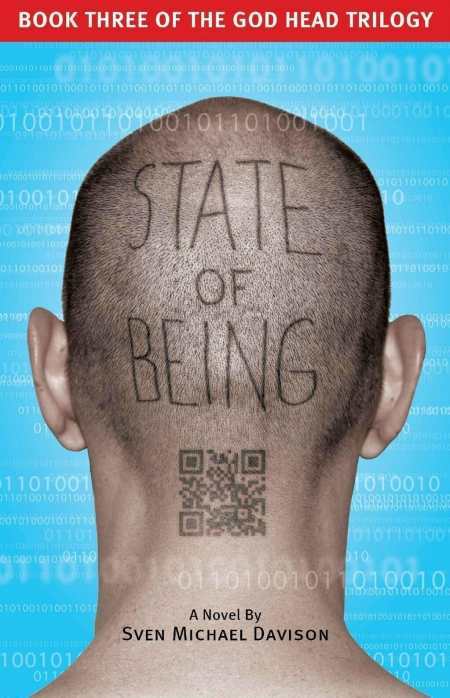 Wrapping up the God Head Trilogy, the standout science-fiction series of the decade, Sven Michael Davison’s State of Being challenges the definition of humanity as artificial intelligences battle over what remains of humankind’s future. By depicting the growth of the AIs in terms of accelerated human development, Davison turns even the most sadistic of his monsters into a believable product of its environment and provokes the same mix of sympathy and fear readers would feel for a well-written, flesh-and-blood antagonist. Despite his creation of a human death toll in the billions, the author never crosses the line between tension-building and gratuitous violence. Picking up right where State of Union left off, the power-hungry Consortium unleashes Constantine, a new AI, into the CyberWire as a way to control the millions of hacked minds, known as Pin Heads, following the spread of the supervirulent nanovirus MaxWell2. From Riyadh to isolated pockets across South America, the tattered remains of humanity fight a losing battle against a foe that can outthink, outnumber, and outmaneuver them at every turn. Although a carrier of the virus, ex-cop Jake Travissi is one of few humans not yet hacked and controlled by the Consortium. Still reeling from the death of his wife and a close ally’s horrific betrayal, Travissi receives a call for help that comes with a hope for escape: the last rocket to a quarantine on the still-unaffected free colonies of the moon, where scientists had been working on their own AI. As always, Davison is at his best when confronting characters with impossibly difficult situations. He takes what could have been a jarring example of deus ex machina and masterfully uses it to introduce humanity to the gods created in their image from the machines. Well edited and proofed, this novel from small-press publisher Bedouin Books is a pleasure to read. Short chapters perfectly match the staccato bursts of action. When scanned, QR codes placed at the beginning of each chapter bring up the cryptic tagline “The child of darkness is light,” and highlight the story’s focus on technology in an amusing and interactive way without distracting readers with red herrings. However, unlike the other two books of the God Head Trilogy, which stand on their own, State of Being must be read after State of Union. With a writer as strong as Davison, this isn’t a drawback. Rather, it’s a chance to spend more time in a great story.